C.C. 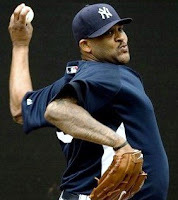 Sabathia has come down with the flu, and was excused to leave camp today, according to Hoch. He was expected to pitch batting practice today for the second time this spring, but after vomiting this morning he was permitted to leave. I'm just glad this is happening now, not later. We need him healthy all year.